Several decades ago, a typical arbitration would involve one claimant against one respondent. Over the years, more and more cases involve several claimants against several respondents. Today, one third of all international ICC arbitrations seem to involve multiparty cases, multi-contract cases involving multiple contracta, multiple parties. The evolution has continued and the debate today is whether it would be possible for a class of people in the same situation or a group of citizens having the same interest to start one single arbitration procedure as a group or as a class. 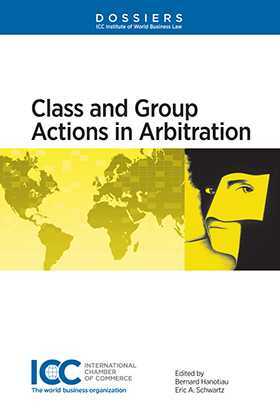 This publication examines the complex issues involved in class or group arbitration on a comparative law basis. Is there a place for such proceedings within the framework of the arbitration process? Class action procedures, as developed in the United States court system and more recently in Canada, are almost nonexistent in Europe. The European Commission has advocated collective redress as an important means of access to justice but class actions have found little enthusiasm in the Members States. The book highlights the lessons which have been learned from the experience of cases in the US and in Europe. What does the future hold for class, collective and mass arbitrations? Are they a marginal phenomenon or has their potential yet to be realized? What are possible solutions to the issues that have been encountered? Can we expect to see more of such arbitrations in the future? Written by arbitrators, academics and practitioners, this Dossier will provide the answers to these questions and many more. Class Arbitration In the United States: Life After Death? Will Canada Be the Next Frontier in Class Arbitration?